It wasn't long ago when Albany River Rats defenseman Casey Borer was unsure if he'd ever play again. 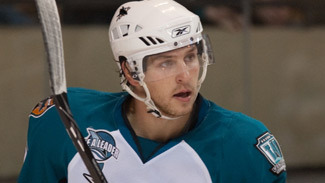 A third-round draft pick by the Carolina Hurricanes in 2004, Borer had 4 goals and 6 assists in 51 games in his second season as a pro in 2008-09. At 6-foot-2, 205 pounds, Borer could be counted on to block shots and provide a steady presence in the defensive zone. A native of Minneapolis, Minn., Borer and his family owned season tickets to the Minnesota North Stars when he was growing up. He played his college hockey at St. Cloud State and had already appeared in 14 NHL games with the Hurricanes, chipping in a goal and two assists. But on one winter night, his entire hockey career and way of life nearly came crashing down. Lengthy bus rides are part of life in the American Hockey League, and teams frequently have to travel in less-than-ideal weather. But after what transpired on Feb. 19, 2009, those rides will never feel quite the same again for Borer and the other 28 men who were aboard. The River Rats were traveling through a snowstorm on the Massachusetts Turnpike in the rural western portion of the state, on their way back to Albany following a game in Lowell, Mass. Most of the group was asleep when their bus -- carrying the team's players, coaches, and support staff -- suddenly slid in the wintry conditions, struck the left guardrail, and overturned on its left side shortly before 3:30 a.m. in the small town of Becket, Mass. "I was sleeping, it was late at night, and it didn't really hit me until I was flying through the air," Borer recalled last week. "I was sleeping on the right side of the bus ... and I fell through the air and hit my head on the (left) luggage rack. I couldn't believe it. I was more in shock than anything." "It happened so quickly, and it was so late, guys were sleeping, and you didn't know what was going on," said Albany coach Jeff Daniels, who won the 2006 Stanley Cup as an assistant coach with Carolina and was in his first season guiding the Hurricanes' top affiliate. Upon impact, Daniels was thrown over the front-seat railing and into the lap of the bus driver. When Borer looked around, he felt pain in his neck but saw many of his teammates cut and bleeding, trying to get their bearings. He thought they were in much worse shape than he was. With the undercarriage of the bus still sticking out into oncoming traffic, everyone managed to crawl out of the wreckage through the roof hatch and the windshield, which was kicked open. "We were very fortunate to be able to walk off that bus," Daniels said. After helping some of his teammates to safety, Borer sat on the highway's guardrail and propped his head up against teammate and roommate Mark Flood. "Everyone got as far away from the bus as we could," Borer said, "and I just thought I had whiplash. I wasn't able to hold up my head, and I hadn't really had anything like that before." Upon the arrival of emergency personnel, Borer wanted them to first tend to the players who were bleeding. The 24-year-old even called his mother from the highway to inform her that there was a crash but he was fine, lest she hear about it on the news. The entire group was transported to nearby Berkshire Medical Center for evaluation and treatment. X-rays were taken once Borer complained of neck pain, and before long, doctors returned to deliver the startling news that he had a broken vertebra in his neck. "It got real serious in a hurry," said Borer, who immediately underwent an additional series of tests. "You do everything you can do stay healthy on the ice, and the way you end up breaking your neck in a crash. I had to tell myself to relax for a second and realize how lucky you are that you or your teammates aren't hurt even worse." He remained hospitalized for several days along with four others who had suffered serious injuries -- teammates Nicolas Blanchard, Joe Jensen and Jonathan Paiement, along with radio color commentator John Hennessy. Borer's 2008-09 season was certainly over and there was initially some doubt as to whether he would ever be able to resume his hockey career. He had to wear a brace on his neck for eight weeks following his release from the hospital and was especially limited in what he could do during the early weeks. "The whole thing was a mental and physical struggle for me," Borer said of his recovery. Shortly after the River Rats broke for the summer, Borer felt stronger and was cleared to resume light skating on his own at home in Minnesota in preparation for training camp. But after a series of skating sessions, he discovered that the pain in his neck had not subsided to the point that doctors had expected. "I was trying to do everything to block it out, but I couldn't pretend like it was okay anymore," he said. "I knew I was cleared ... but I went and got a second opinion and then another opinion." After receiving conflicting advice, Borer got back in touch with the Albany trainers and doctors, and eventually it was determined that Borer would require surgery on his neck to fully rectify the problem. He underwent the procedure at the beginning of training camp in September, and then he was back in the neck brace for another six weeks, which he spent at home with his family. During that time, he couldn't drive, he couldn't lift more than about five pounds. He barely even left the house. "There was a lot of feeling like, 'What is next for you?'" Borer recalled. "I wanted to play hockey. That was my main goal, that's what I worked towards. But eventually just returning to a normal life was the end goal that I dangled in front of myself." He recounted a story from those tough weeks in which his mother explained that a gallon of milk weighs approximately eight pounds. So that Casey would be able to lift it, they purchased only half-gallons. Finally, in mid-November, Borer was again able to remove the neck brace and get back on the ice, just skating slowly by himself. He rejoined the River Rats on Dec. 1 and was soon cleared to shoot pucks, which eventually led to him participating in non-contact portions of practice with his teammates. "Just being part of the team again (was great). It was awesome being able to go into the locker room and hang out, and joining the team for practice was even better," Borer said. "It was good for him to start coming by the rink, to start feeling like part of the team," Daniels said. "At the same time, it was good for the players to see him, to see that Casey is up walking around." Borer gradually worked himself back into game shape and in early January received final clearance from the doctors to play. More than 11 months after the bus crash, Borer made his season debut for the River Rats on Jan. 23 at Adirondack. "It was like playing my first game again," he said. Borer has totaled four games since his return and got on the scoresheet for the first time when he contributed two assists on Jan. 30 in a loss at Hershey. More than anything else this season, his goal is just to stay in the lineup and enjoy playing hockey again. "You really look at things differently when something that you've done your whole life, worked for your whole life, is almost stripped from you," Borer said. "You don't ever want to take it for granted, and you have to realize how fortunate you are."